It's still Monday if you ain't gone to bed yet. Tune in on Thursday at a more reasonable hour for yet more unreasonable antics! I like the comics on your blog, especially the "mountain out of a molehill" one. Thank you for sharing your talent. I have a small futon business and I am wondering if you would put a link to my site on your home page, my site is called www.thefutonsite.com. In exchange for linking to my site I would love to offer you a $50 certificate towards any item in my store. Check out my site and see what you think, and if this interests you"
So, the futon featuring post which would have lead this guy here clearly states that peoples futons are often covered in oats and hairs. Did you just read the word Futon and bliss out? Next stop Monday stand-up fans! Remember back in day dot when Bone said his job was making mountains out of molehills? Granted the storyline never really took off but it was still his (never spoken of) job up until this career sidewinder into stand up! Rethink Bone, not the time for an unsteady career change in these tough economic times! Arrrgggghhhhh!! See you Thursday!!! Looks like Monday's episode took the bank holiday after all, here it is on Wednesday, new one tomorrow and then we're back to Monday as usual. Routine is good? 3 - fat poss drunk landlord man referring to the man who rented his property (and stood accused of growing a heroic dose of hydrophonixxx in three houses in bolton, "cannabis farms" no less) as "the oriental gentleman" about a thousand times, triple cringe!!! 2 - 'orrible denim clad orange faced Macca who was accused of threatening someone with a fake gat, describing his whereabouts on the night of the halleged incident, he'd had a few cans - the prosecuting lawyer (blind by the way, awesome) quizzed him on how many "a few cans" was, to which he replied...just a few, four or five. He followed up that classic with, "just had some beers, got back home, HAD MY RITUAL POT NOODLE and went to bed". Hold up! Reeeewind, ritual WHAT noodle? Advice for Macca in the future, don't look at and address "the ladies" in the jury, for instance if you're saying "believe it or not, LADIES, I get more action dressed as a woman than a man", which you did say dintcha! wot a wanka! 1 - ropey also pissed woman who was bringin' the case to Macca for fake gun fun answered at one point when being harangued by the lawyer with "Yeah but you did do that though DIDN'T YOU" type questioning, "Yeah, You're right. I made it all up...NOT!" Luckily the judge was au fait with the ...NOT jokes kids use these days. Sarcasm ain't dead baby! 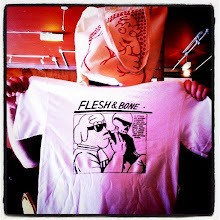 Flesh and Bone to follow in about an hour, then back to normal service tomorrow...NOT! Only joking, really it is.